It was an exciting night for Gators fans Wednesday as for the first time since Kasey Hill and Chris Walker in 2013 there were Florida commits playing in the McDonald’s All-American game, the premier showcase of the best players in high school basketball. Scottie Lewis and Tre Mann were on display before heading to Gainesville this summer and it was wonderful to see them amongst the nation’s best getting recognized for their talents. 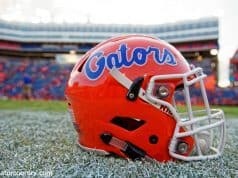 Here is what I saw from the future Gator stars. Tre Mann was playing on Team West who in my opinion had far less talent then their East counterparts. 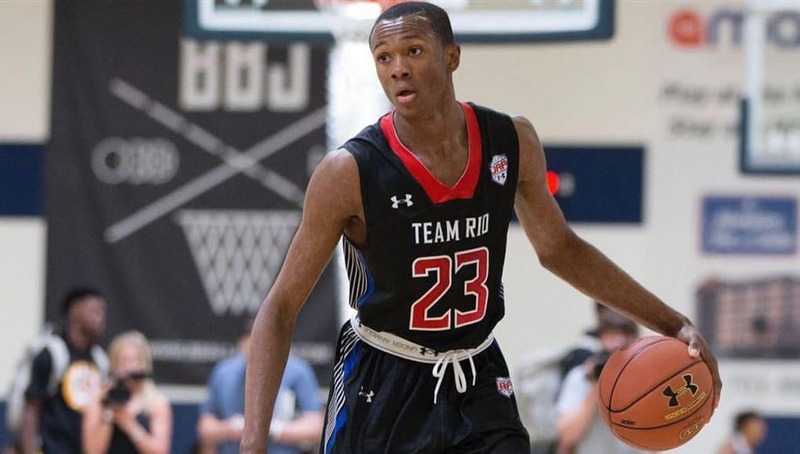 Nevertheless, Mann looked comfortable playing with and against some of the best talent in the 2019 class and his fluid athleticism is on display every time he starts to make a move towards the hoop. Showing tons of elusiveness with the dribble he had defenders off balance with the slightest of head fakes and that is an incredibly important skill the Gators have been lacking the last two seasons. Mann’s skill at breaking defenders down off the bounce didn’t result in any driving buckets for him in this game but he definitely still showed his ability to pressure defenses and despite the fact it didn’t lead to layups in this contest he showed it’s going to lead to layups within the properly spaced offense of a college team. His side to side movement defensively also looked good and considering the fact he was guarding some electric guards on the East team I think he projects to be a solid defender with the Gators next season. Mann a smooth stroke and it’s one that makes you think the ball is always going in for him when it leaves his hand, even though one of his deeper attempts missed the rim entirely and only caught backboard. He made one really nice deep three from the left wing that splashed confidently and showed his range, something incredibly exciting moving forward. The McDonald’s All-American game is one of those strange showcase atmospheres where the game is played at half speed except for strange bursts when players want dunks and I don’t think Mann was comfortable in that setting and that’s why he didn’t look great tonight from a scoring standpoint but that doesn’t bother me one bit. He’s going to thrive in faster games where he can control pace when he has the basketball and this just was not the setting for him, but his silkiness was still apparent whenever he dribbled the basketball and I’m incredibly excited for him to be in Gainesville. Fairing better in this game offensively than Tre Mann was Scottie Lewis who had a few more shots fall on his way to 10 points. Of those 10 points 6 of them were on impressive drives to the hoop that really showed his speed in the open floor and his explosiveness at the rim. What was also impressive about his points were the fact that there wasn’t a single play ran for him in the half court and his offense all came from his hard work and ability to read the floor and find open space, especially on his first bucket of the game where he had a great cut to the hoop for an easy lay-in. While his baskets were nice what was really impressive to see was his work on the defensive end. Yes, it may have been more apparent because it was in an all-star game that didn’t have a ton of defense played but the fact he was getting after it in a game setting like this shows his competitiveness and gave Gator fans a taste of what it’s going to be like when he locks in defensively next season. His anticipation defensively is excellent and he’s got a motor that is constantly running which allows him to continue to defend at a high level for an entire game. While noticeably smaller-framed than a lot of other wings in this game his quick feet made up for a lack of bulk and it allowed him to get to spots first and frustrate whoever he was guarding. His effort on the defensive end had the broadcast team gushing over him on multiple occasions throughout the night and anyone who hadn’t heard of Scottie Lewis before tonight definitely know him now. Unfortunately none of Lewis’ jump shots found the twine but he shot the ball really well in high school this season and hopefully that translates to success in college. He could very well be one of the best perimeter defenders in the country next season and if he is able to be a decent 3-point shooter while also getting the buckets in transition off hard work he got tonight he’s going to be an incredibly impactful player. 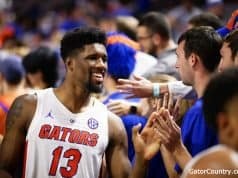 Having two Gators in the McDonald’s All-American game is huge for the Florida basketball program and I don’t think the importance of this should be missed. 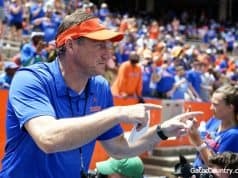 I’m not saying I think Florida has fallen off the national radar but having two players in the biggest showcase in college basketball should show some future recruits that the Gators are a home for the elite and having Scottie Lewis be the most talked about player in the broadcast should also give some more credibility to what’s going on in Gainesville.